In the South American jungles, ayahuasca is used in religious ceremonies to induce visions and also as a remedy to cure illness. New research suggests ayahuasca, a jungle vine found in the Peruvian rainforest, can have a powerful effect on the human central nervous system when brewed with other plants. Researchers say one of ayahuasca's most promising uses could be in treating drug and alcohol addiction. According to the World Health Organization, medicines derived from plants play a major role in the health care of 80 percent of the world's population. Western medicine has synthesized many of these natural drugs, from the painkillers in willow bark to the anti-cancer compounds in the neem tree, and is constantly searching for more pharmaceuticals in the biodiversity of the world's forests. Ayahuasca is one traditional plant-based medicine that has drawn the attention of investigators. In the South American jungles, it is used in religious ceremonies to induce visions and also as a remedy to cure ills. At the Onanyan Shobo spiritual retreat center in the rainforest near Iquitos, Peru, shaman Alfredo Kayruna Canayo shows off a section of the twisting, leafy vine. "What ayahuasca means is vine of the dead," he explains through an interpreter. "Some people call it soul vine." Ayahuasca is known as a master plant, a very powerful remedy that treats the whole person: body, mind, and soul. 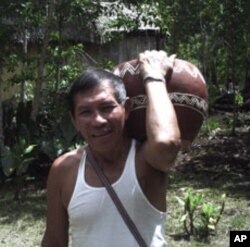 "The ayahuasca [can] cure anything you have," the shaman says. "Start with simple things. For example, it's very simple to cure or repel the bad energies from your insides. What is the bad energy? One of them could be the fears, then some wound or injury you have." Shaman Alfredo heads for a treatment at Onanyan Shobo. Whether the plant is being used for religious or medicinal purposes, ayahuasca is taken only in a ceremonial setting under the direction of an experienced shaman. 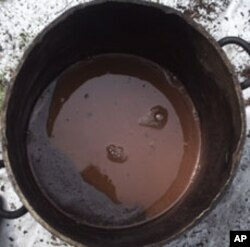 To turn it into a drink, also called ayahuasca, pieces of the vine are pounded into a pulp and combined with several other plants, then brewed down for eight or more hours into a thick orange liquid. That combination, shaman Alfredo says, is critical. "Only by itself, this plant doesn't work good, you have to add this with the other plant - the chacruna - which is the help to the ayahuasca. In Shipibo culture, they believe the chacruna is the wife of ayahuasca because they help and work together." An international research team is investigating the pharmaceutical potential of ayahuasca, known scientifically as Banisteriopsis caapi. Principal investigator, Dr. Charles Grob, is a professor of psychiatry and pediatrics at the UCLA School of Medicine. His team has done a chemical analysis of the medicinal drink. Pieces of the vine are pounded into a pulp and combined with several other plants, then brewed down for eight or more hours into a thick orange liquid. While the shaman's characterization of the herbal interaction may be whimsical, Grob says science confirms that the ayahuasca brew is a potent medication. "It's a very sophisticated form of pharmacology, which somehow the native peoples of the Amazon region have figured out. Ayahuasca is generally a decoction of two plants. Each plant if taken separately has no effects on the human central nervous system, but when taken together there's a very powerful synergy." The active ingredients in the brew are DMT, a naturally occurring brain chemical similar to serotonin, and a natural antidepressant. DMT is inactivated in the human gut, but when combined with the antidepressant, it can be absorbed by the body. Grob says one of ayahuasca's most promising uses is in treating drug and alcohol addiction. "Number one, it does not appear to be addictive and the individuals do not develop a tolerance, they do not go through withdrawals, and generally speaking, it is very unusual for people to take it on consecutive days over an extended period of time." The potion also has anti-parasitic properties, which can help prevent malaria. There is also some evidence that it diminishes the symptoms of Parkinson's disease. The U.S. Food and Drug Administration classifies the principal active ingredient in ayahuasca as a Schedule 1 controlled substance, which is not considered to have any legitimate medical use. As a result, the ayahuasca brew is illegal in the United States, and most of the pharmaceutical studies are being conducted in South America. Grob says the studies are important. "There's great potential to learn about the range of ayahuasca and to explore its therapeutic value, but first steps first, and I think first we need to fully understand how it's utilized in South America and then do trials in the U.S. and Europe." 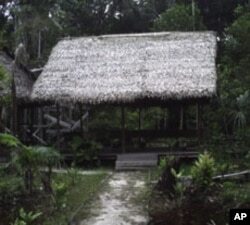 Retreats like Onanynan Shobo in the Peruvian jungle, have become popular destinations for the medical tourism industry. Because many Shamans claim ayahuasca cures a variety of cancers, tumors, and other diseases, the Peruvian jungle has become a popular destination for the medical tourism industry. Most of the visitors at Onanynan Shobo, where Shaman Alfredo practices, are European, with the remainder coming from the United States, Australia and Asia. As long as its use in western medicine is illegal, anyone wishing to explore ayahuasca's medical benefits will have to come to the source in South America.